Is Ratio really the best app in Personal Info Managers category? 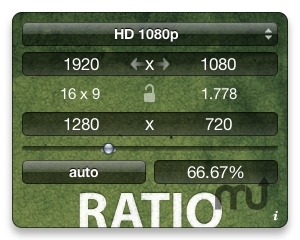 Ratio is a Dashboard widget for calculating common screen resolutions of various sizes. Includes presets for HD, NTSC, PAL, Apple iFrame, iPhone/iTouch, iPhone 4, iPad, Microsoft Zune HD, Windows Mobile, and Surface, Fullscreen and Widescreen PC, and more. Handy for working with various image sizes, element scaling, and other common CG calculations (tailored for motion graphics and interactive design, this widget does not calculate DPI or non-square pixels). The double arrows let you swap width and height settings, easily switching an iPhone or Zune HD from vertical to horizontal, or more easily dealing with store displays using vertical HD monitors. The lock icon sets the current aspect ratio as master; once locked, you can type in any numbers you want, in any field, automatically regenerating values to keep the same aspect ratio. The auto button calculates only exact pixel matches (no more half-pixel skewing like with Photoshop's "keep aspect ratio") and it can be limited to 1, 2, 4, 10, and other integers, making things like WMV-safe compression resolutions much easier to find.